Early dawn and the light was still low so I’m happy to have captured this tender moment. I ramped up the ISO, set a high shutter speed and hoped for the best. 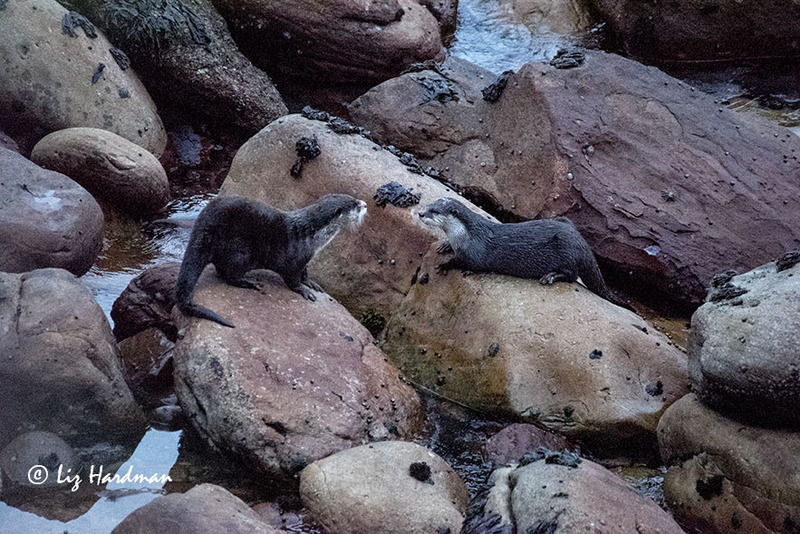 It’s never easy to photograph these shy Cape clawless otters as they are skittish, not hanging around when they sight humans. On occasion I’ve managed to leopard crawl to a close vantage point, but not this time – they were onto me seconds later and gracefully disappeared into the water. Saw my first one last year eating a fish…still one of my best sightings for 2014. Nice shot. Yes love their hands like claws. So cute, it must be wonderful to se them in action. Great job getting a picture of these guys. I’ve only seen otters in the zoo and they are so fun to watch. What a thrill to see them in the wild. Yes :). It is a thrill and feel very fortunate to see them here along the urban edge. Nice capture Liz, I’ve yet to see one in the wild. On my photographic Bucket List to photograph them. I wonder what’s going on between them! Oh, wish i could happen in on their conversation 🙂 They’re a mating pair, and had been dust bathing before i rudely came onto the scene; I had hoped to be undetected, but they picked me up with the camera click. I think they had spend the night in the holt and were ready to go off fishing. Hope to see them back again soon… and really hope to see some young offspring. It’s ages since we’ve seen any young. Leopard crawling over the rocks speaks to a high level of birding and photography dedication. Thanks for these shots. Hehe … the lengths we go to … and the neighbours watch my entertaining antics with much interest. I have to cross a grassy patch before getting cover from the rocks. If i’m downwind have a better chance of being undetected. There’s a caracal (lynx) in the area, now that’s a different kettle of fish. Have to be more vigilant when i’m lurking under cover.